See Saint Peter’s as you’ve never seen it before with Italy’s Best exclusive Vatican Gardens Tour. There is no better view of Michelangelo’s magnificent dome from anywhere else in Rome than inside I Giardini Vaticani, the oldest gardens in Europe, where each and every Pope had a favourite spot for prayer and meditation. Bypass the long lines with your private English-speaking guide from Italy’s Best and gain private access to the Vatican Gardens. The Italian, French and English landscaping glistens among the delicate water jets of the fountains, which include the majestic, seventeenth century Fontana dell’Aquilone. The cascades and rivulets form a perfect setting for the fifteenth century villa of Pius IV, home to the famous turtle pond, while 300 parrots nesting in the tree tops add colour as well as a natural soundtrack amid the enchantment of this botanical jewel. Don’t let the garden’s peaceful and discreet atmosphere mislead you, however, as it holds a distinct juxtaposition between tradition and modernity. The Poor Clares residing in the convent cultivate the kitchen garden, growing the vegetables served at the Pope’s table, while the heliport built by Paul VI is used by pontiffs on brief journeys as well as by heads of state visiting the Holy Father. Beyond this Garden lies the heliport built under Pope Paul VI which Roman Pontiffs now regularly use when going on their numerous pastoral journeys. The Vatican’s railway station, dubbed “the most beautiful in the world” by Pope Pius XIwas built between 1929 and 1932. No longer open to the public, the station is used solely for special occasions, one of the most famous being when Pope John Paul II welcomed the railwaymen in the course of the XXI Railway Workers Day on 8 November 1979. The station’s salon became the Goods Office in the late 1980s and was divided to make room for the Philatelic and Numismatic Museum. Today the building houses the commercial heart of Vatican City. Following the Lateran Accords in 1929, Pope Pius XI commissioned world-renowned scientist Guglielmo Marconi to create a radio station inside the new Vatican State, which allowed the papacy to communicate with Catholics worldwide, particularly in countries where totalitarian regimes prohibited religious freedom.On 12 February 1931, Pope Pius XI himself inaugurated the Vatican Radio Station with a speech in Latin that stirred emotions on an international level. Get the chance to see how technology, specifically radio, has changed and impacted the world over many years. 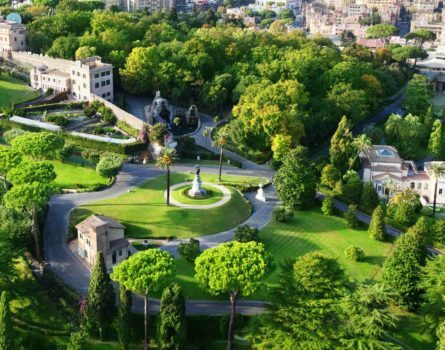 The unique experience of this Vatican Gardens tour is an opportunity to enter into the heart of the Vatican State and discover secrets that are at once ancient and fully modern.